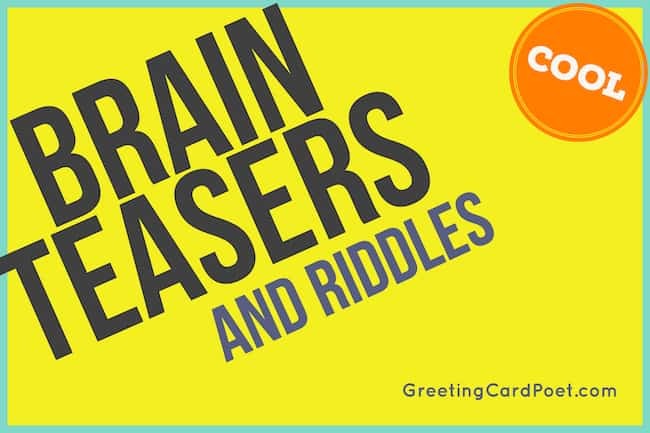 Brain teasers exist to challenge, intrigue and amuse. They stump many people because most of the times the puzzles don’t follow typical protocol. They don’t have a straightforward logic. So, especially for younger minds, you can stump someone. Frequently, these mind teasers encourage a false assumption. When the answer is revealed, it’s not uncommon to hear a groan or two. 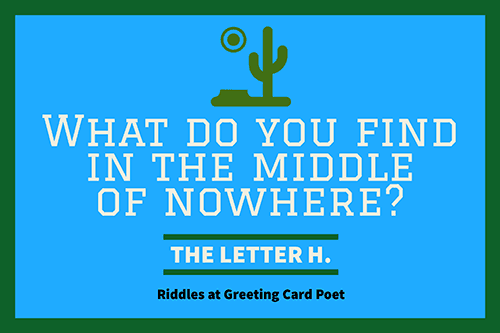 Riddles challenge people to stretch their brains and think outside of the box, which is what makes them so beneficial to our minds. Not only can they improve our mental state in more ways than you may expect, but of course they provoke a ton of “aha” moments! 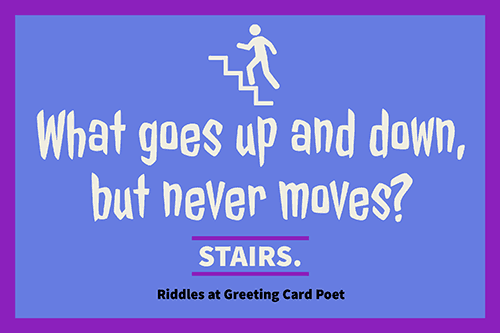 Challenge yourself with our collection of riddles with answers to solve and share. 1.) What word starts with IS, ends with AND, and has LA in the middle? 2.) There are four brothers in this world that were all born together. The first runs and never wearies. The second eats and is never full. The third drinks and is always thirsty. The fourth sings a song that is never good. Answer: Water, fire, earth, and wind. 3.) What do you call a man in a hole? 4.) What’s a great name for a female lawyer? Answer: Sue. Check out our funny puns. 5.) Do you want to hear a joke about potassium? 6.) What should one do with a dead chemist? 7.) I am the beginning of the end, and the end of time and space. I am essential to creation, and I surround every place. What am I? Answer: The letter “E”. End, timE, spacE, Every place. 8.) Which is the fastest country in the world? 9.) What do you get if you throw a million books into the ocean? 10.) What is the coldest country in the world? 11.) Why did the lumberjack cut down the tree? Answer: Because he said that he wood. 12.) What do volleyball players wear on their skin when playing outside? 13.) Why did the house go to the doctor? Answer: Because it had a window pane. 14.) On which roads do ghosts linger? 15.) What is round and extremely violent? 16.) Why did the fan get dizzy? Answer: Because it said it had the spins. 17.) 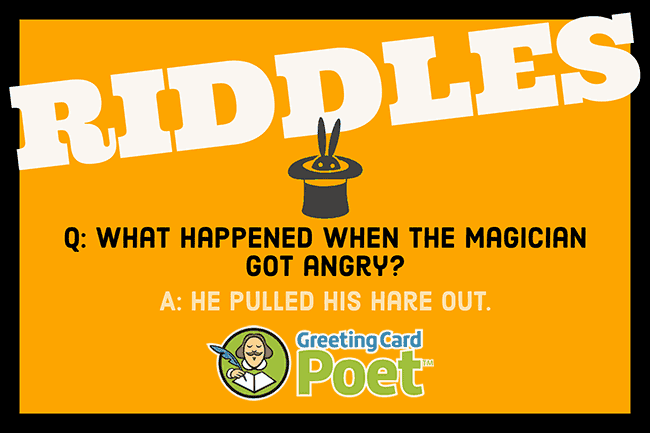 What happened when the magician got angry? Answer: He pulled his hare out. 18.) Why do jalapenos love the sun? Answer: Because they are hot peppers. 19.) What kind of kitten works for the Red Cross? Check out some more animal puns. 20.) I go around all the places, cities, towns and villages, but never come inside. What am I? 21.) I never was, am always to be. No one ever saw me, nor ever will. And yet I am the confidence of all, to live and breath on this terrestrial ball. What am I? Answer: Tomorrow or the future. 22.) What did the sign read at the post office when a tiny fortuneteller escaped from jail? Answer: Small medium at large. 23.) What goes into the water black and comes out red? 24.) Smell me, buy me, and deliver me. I won’t change. What am I? 25.) Who spends the day at the window, goes to the table for meals and hides at night? 26.) There was a green house. Inside the green house there was a white house. Inside the white house there was a red house. And, inside the red house there were lots of babies. What is it? 27.) What common eleven-letter word is always spelled incorrectly? 28.) What did the person who invented the door-knocker win? 29.) What happened to the woman who fell into the upholstery machine? Answer: She was fully recovered. Check out our Puns for Children. 30.) Did you hear what happened to the origami store? 31.) Why did the vegetable get booed off stage at the comedy show? Answer: Because he had too many corny jokes. 32.) I am taken from a mine, and shut up in a wooden case, from which I am never released, and yet I am used by almost everybody. 33.) Why did the banker quit his job? Tip: These brain teasers are great for teachers looking to spend a few minutes of time before a next major time block. Or, include one or two on a test to show the fun of learning. 34.) What do you find in the middle of nowhere? 35.) Why was everyone so tired on the April first? Answer: Because they just completed a March of 31 days. 36.) What did one commode say to the other commode? 37.) What is it that stands up, but grows down? 38.) What happened to the human cannonball? 39.) How can you go eight days without sleep? 40.) There are 3 stoves. A glass stove, a brick stove, and a wood stove. You only have 1 match. Which do you light up first? Answer: You will light the match stick first. 41.) What goes up and down, but never moves? 42.) What happened to the lion when he ate the clown? Answer: He felt a little funny. Tip: Brain teasers are fun to solve in small groups. If you working with kids, form small teams, and see if better solutions come about. 43.) What did the quilt say to the bed? Answer: Don’t worry, I’ve got you covered. 44.) Two fathers and two sons went duck hunting. Each shot a duck but they shot only three ducks in all. How come? Answer: The hunters were a man, his son and his grandson. 45.) If you have two bills in your hand that add up to $25 and one isn’t a $5 bill, what bills do you have? Answer: One twenty and one five dollar bill — One isn’t a five dollar bill, but one is! 46.) Which would you rather have: a piggy bank full of nickels, or the same piggy bank half-full of dimes? Answer: The piggy bank half-full of dimes. Dimes are smaller in size so you’d have more money. 47.) If Megan had 4 piles of sand and Molly had 5 piles of sand, and they put them all together, how many piles would there be? Answer: One! Duh, they put them all together. 48.) Brenna was walking down a street with no street lights dressed in a black dress, with a black hat and black shoes. A black car approached her with its lights off, yet was able to stop before hitting her. How did the driver see Brenna? 49.) Two boys played 7 games of checkers. Each wins five games and yet there were no ties or draws. How can this be? 50.) The teacher asked the two girls who looked exactly alike the following questions: a.) Are you from the same family? b.) Do you have the same parents? c.) Were you born on the same day? They answered truthfully “yes” to those questions, and yet told the truth when they indicated they were not twins. How can this be? 51.) Four football linebackers were able to stay dry while standing under one umbrella. How could this be? 52.) If you’re running a marathon and pass the person in 2nd place, what place are you in? Answer: 2nd place. If you pass the person in first place, you’d be in first place. 53.) A rope tied around a dog’s neck is 10 feet long. His food dish is 15 feet away. How did the dog eat his dinner without cutting the rope and without help? Bennett left home sprinting. He ran a ways and then turned left, ran the same distance and turned left again, ran the same distance and turned left again. When he got home, there were two masked men. Who were they? Answer: The catcher and umpire. Bennett was playing baseball. Bennett is standing next to three switches. The switches belong to three bulbs in a room behind a closed door – the door is tight closed, and heavy which means that it’s absolutely impossible to see if any bulb is on or not. All three switches are now in the off position. Bennett can do whatever you want with the switches and when finished, open the door and go into the room. While in there Bennett has to tell which switch belongs to which bulb. How will he do that? Answer: Bennet must turn on the first switch and wait for a while. Then, he must turn off the first one and turn on the second. Then, he goes into the room. One bulb is shining, the second bulb is hot and the third one nothing. He knows which switch is tied to which bulb. Elementary. Jonathan is 6’2″ tall and works as an assistant at the butcher shop in town. He wears size 11 shoes. What does he weigh? A man stands on one side of a river, his dog Barney on the other. The man calls Barney, who immediately crosses the river without getting wet and without using a bridge or a boat. How did Barney do it? Answer: Barney did it in the winter when the river was frozen. How long is the answer to this question. Turn me on my side and I’m everything. Cut me in half and I’m nothing. What am I? Answer: The number 8 (eight). I am heavy and hard to lift, but backwards I am not. What am I? Michael’s father had three sons: Snap, crackle and …. who? There are three light bulbs up in your attic. All of them are turned off and their switches are installed downstairs. You can play with the switches as much as you want and after that, you can visit the attic above just once. How can you find out the correct switch to bulb? Answer: You turn the first switch on, then wait for 30 minutes and turn the second switch on. After that, you go upstairs and examine the bulbs. The one which is turned off corresponds to the third switch. The one which is turned on and is still cold corresponds to the second switch. And, the one which is turned on and is hot corresponds to the first switch. 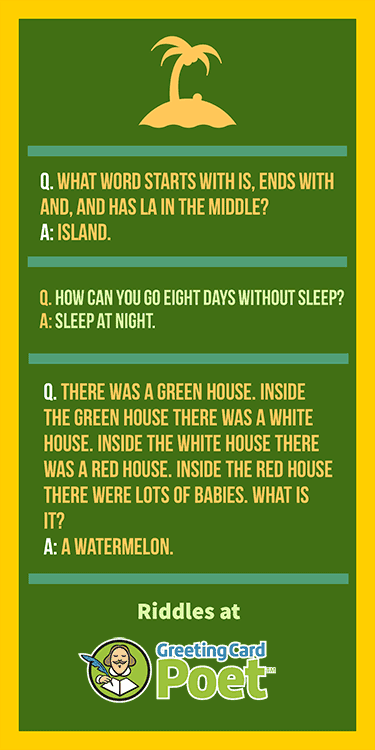 Though riddles are ambiguous, no matter if you’re a kid or an adult they are a ton of fun and provide an opportunity to learn and it’s important to spend more time doing things that you find fun. Continue to stay alert and exercise your brain by resolving our collection of riddles on other pages of our site!